Walk into this bathroom and it feels like you’ve been transported to a spa for the rich and famous. Luxurious touches abound in this master bath while the neutral flooring keeps the space grounded. 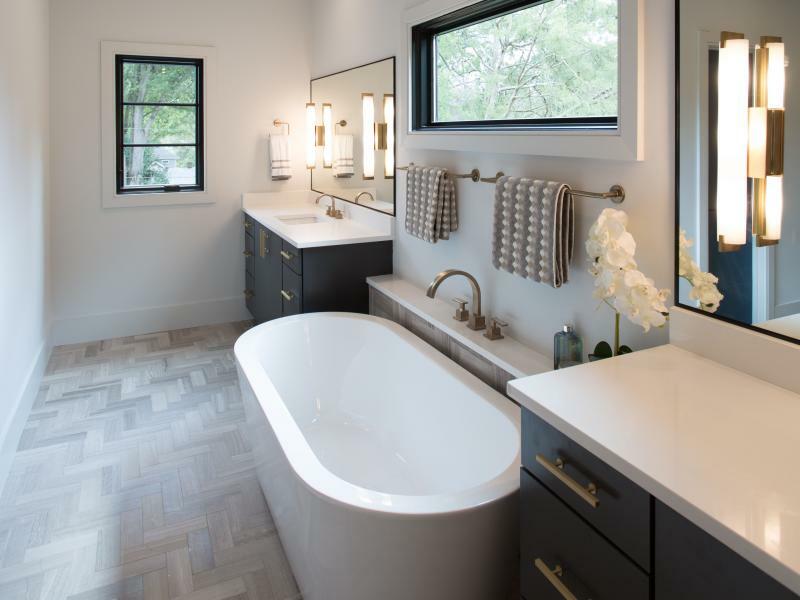 From the brushed brass fixtures to the freestanding tub, the details in this room work together to create more than a bathroom: it’s an experience. A custom finish on the cabinetry adds the final air of luxury needed to complete the regal aspect this space achieves. Designer Cherece had her work cut out for her in this previously cramped kitchen. The addition of cabinet stacks around the refrigerator made the space functional and added some much needed storage without decreasing the room’s footprint. The clients are now enjoying an enviable kitchen complete with storage features including a microwave drawer base, trash pullout, spice pullout, and two lazy Susans. 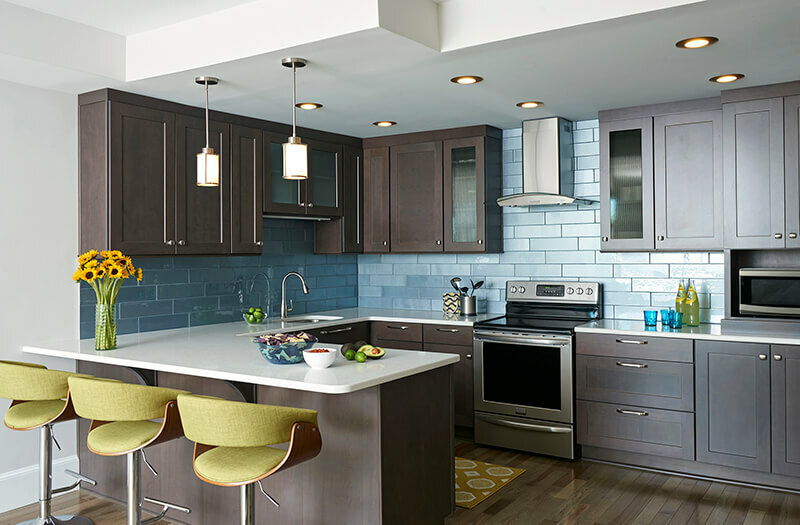 A fresh Alpine finish leaves the kitchen looking open and spacious, while the colorful backsplash adds a touch of personality to the heart of this home. It seems contradictory to say that drama can be subtle, yet this kitchen design achieves just that with its soothing tones and strong lines. The Charlotte resident designing this space wanted something to match the modern exterior of the home. Complete with a few custom features and finishes, this kitchen is defined by the powerful impact it delivers. 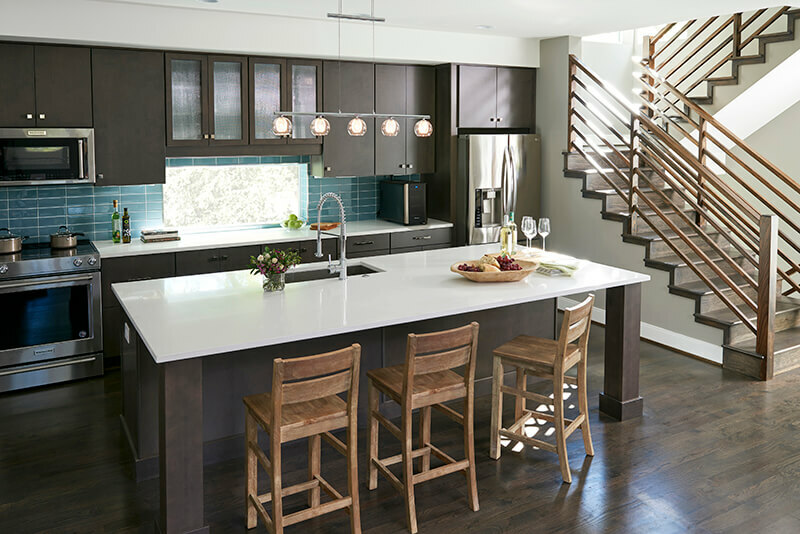 The details that top off this modern dream include a waterfall Quartz countertop on the island, Rayado glass, and sophisticated brushed brass fixtures throughout. 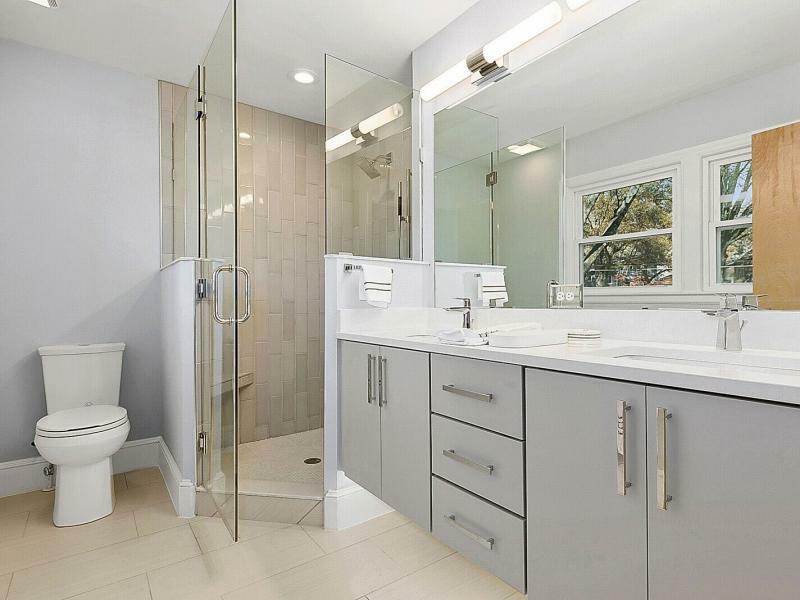 Marked by sleek lines and a simple color palette, this bathroom showcases some of the latest and greatest in contemporary design. Ideal for a calming bathroom setting, a contemporary aesthetic ensures that those lucky enough to start their morning routines in this space experience a relaxing ambiance. The features are not only beautiful, however—masterfully blending form and function is the custom floating vanity, which ticks plentiful storage off this family’s bathroom wish list. At a glance, this cool and contemporary space is simple. Check the specs and you quickly realize that a dual vanity, toe space lighting, and custom drawer stack were all carefully designed to create a stress-free escape from a busy lifestyle. With its sleek lines, slab cabinet doors, and no-fuss aesthetic, the Rega kitchen epitomizes modern design. 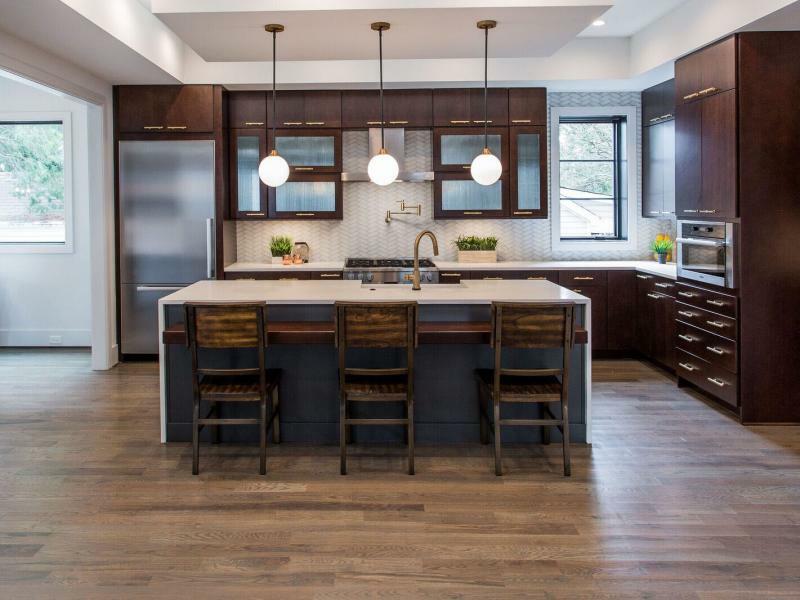 This project features Marsh Cabinets in a Graphite finish. As a stain, Graphite allows for variation in color with the wood species taking a strong presence underneath. This added level of interest places Graphite among the trendiest finishes available. 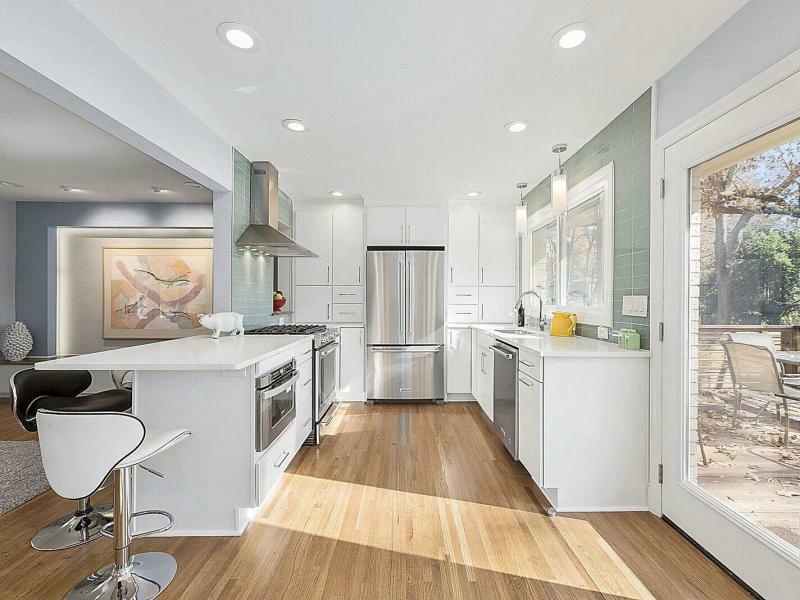 Minimalist hardware, stainless steel appliances, and Quartz countertops break the monochromatic scheme of the island and perimeter, while complementing the overall look. 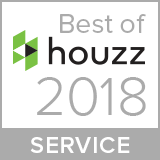 The Holzbaur kitchen is rooted in tradition, but the straightforward cabinetry and hardware pull it into a comfortable, transitional style. 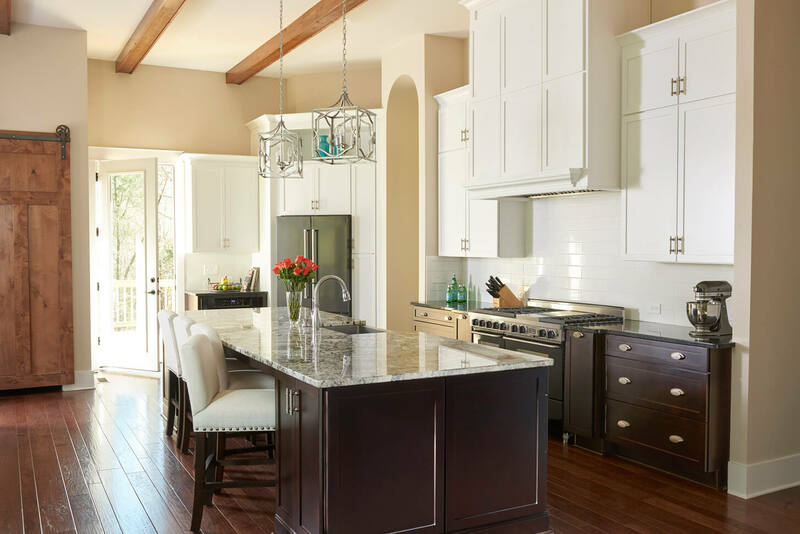 This space keeps the regal aspect of traditional kitchens without overstating its elegance. The bright Alpine finish on the upper cabinets further opens the room and allows the design influence of warmer elements, such as the rustic barn door and wood beams. The space is evidently regal but cozy enough to serve as a quiet backdrop for Holzbaur family reunions, children's birthday parties, and everyday family dinners.